Two Americans won the Nobel Prize in economics on Monday for studying a pressing issue facing the global economy: how to deal with pollution and climate change and how to foster the innovation needed to tackle such problems. 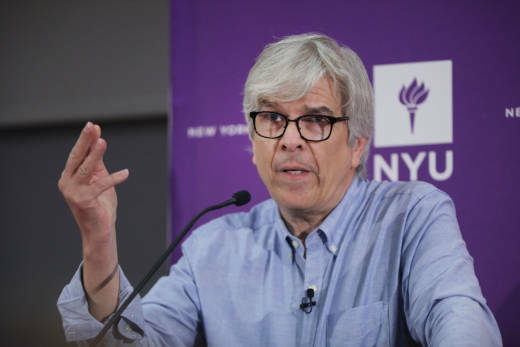 Before moving to New York University, Romer, 62, was a professor at Stanford University as well as a senior fellow at Stanford’s Center for International Development, the Stanford Institute for Economic Policy Research, and the Hoover Institution. Previously, he taught at the University of California, Berkeley. He also founded Aplia, an educational technology company that was based in Belmont, Calif., and then San Francisco; it was bought in 2007 by Cengage. Romer’s father is Roy Romer, who was governor of Colorado from 1987 to 1999 and superintendent of the Los Angeles Unified School District from 2000 to 2006. Paul Romer’s work “explains how ideas are different to other goods and require specific conditions to thrive in a market,” the academy said. Romer’s work found that unregulated economies will produce technological change, but insufficiently provide research and development; this can be addressed by government interventions such and R&D subsidies. The peace prize was awarded Friday to Denis Mukwege of Congo and Iraqi Nadia Murad for their work to draw attention to how sexual violence is used as a weapon of war.___Heintz reported from Moscow.